Only currently available as ISO1 (Single) unit. Internal configuration to suit popular styles of Endoscopy Tray. Advised use for external transport of Endoscopes. Optional Extras: Tow Bar, Cylinder Lock, A4 Document Holder and Various Wheel types. Available in ISO1 (Single) and ISO2 (Double) sizes. Internal configuration can be either shelves or single location modular system. Available in ISO1 (Single), ISO2 (Double) sizes and ISO3 (Treble). 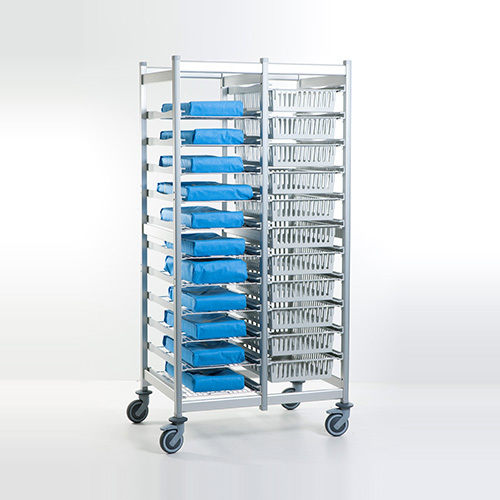 The design of the new-generation Stericart transport carts from Belintra is based on the ISO 400 x 600 mm standard. 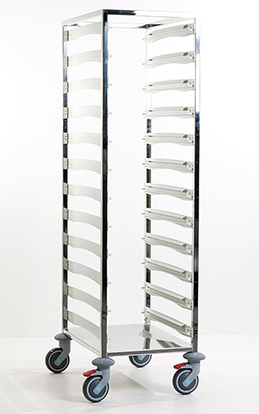 The Stericart is made from highly polished AISI 304 stainless steel and is suitable for use in washing tunnels. 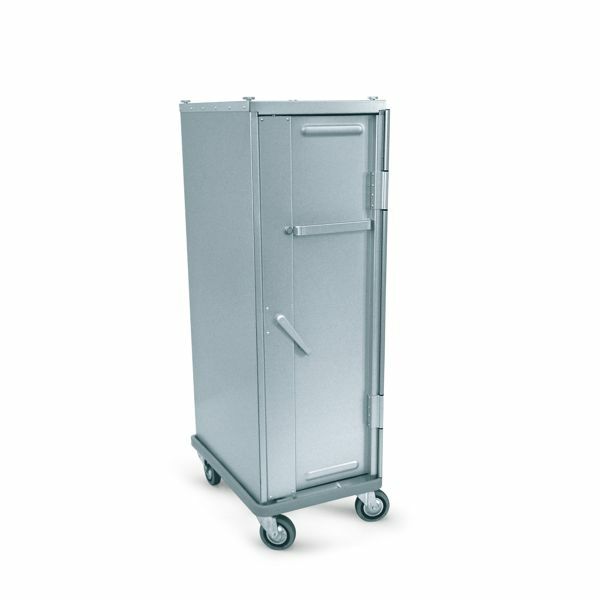 The Stericart was developed as a transport cart between the sterile processing department (SPD) and the operating theatre, while simultaneously serving as a case-cart in theatre. 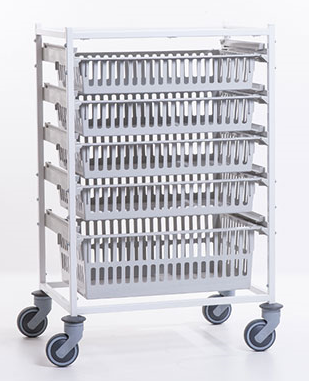 Our range of open, modular ward trolleys distinguishes itself in terms of durability, hygiene, excellent manoeuvrability and load-bearing capacity. These trolleys were designed in accordance with the Euronorm standard. They all have a high-quality, powder-lacquered steel frame. Their finish is UV resistant, scratch proof and impervious to most chemical products. This trolley meets the most stringent hygiene requirements. Thanks to the addition of the additive Bacto-Stop to the coating of the ward trolley, the multiplication of all common bacteria is prevented. These trolleys are primarily for linen transport inside of hospitals. The trolleys with a mobile bottom can be automatically raised or lowered gradually depending on weight load. Trolley cover available. The tambour transport cart is used primarily in the hospital or to transport to and from different departments. It can also be a way to simplify medication distribution in larger departments. It is a storage device for both sterile and non-sterile products and medication comes in a standard light grey. 1100mm, 1500mm or 1800mm high. ISO 1, 2, 3 available. W-type and D-type. 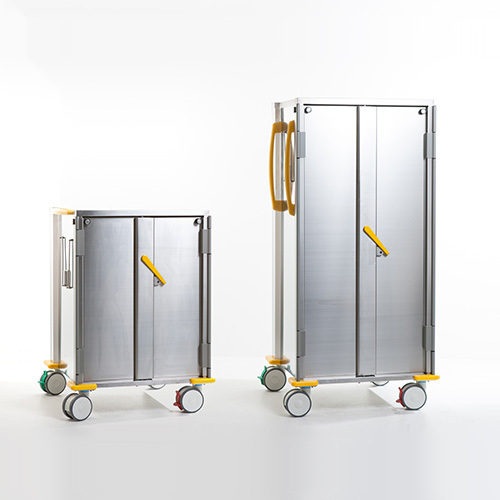 The sterisystem closed, washing-tunnel-resistant stainless steel transport carts are manufactured based on the DIN standard dimensions of 300x600mm, with the idea of being able to use 2 DIN positions one after the other. 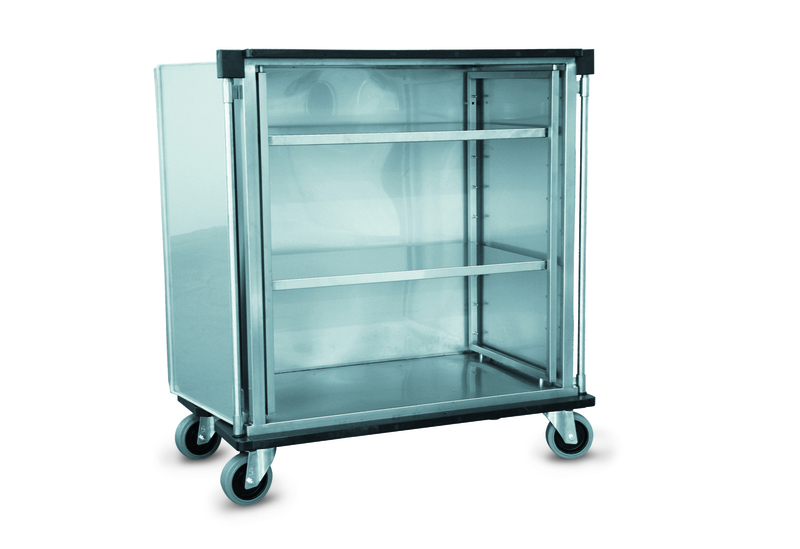 The 50mm extra depth at the back means that this transport cart can also be used to transport slightly longer sets. The new low model (1100mm) can double as a sterile field in the operating theatre. 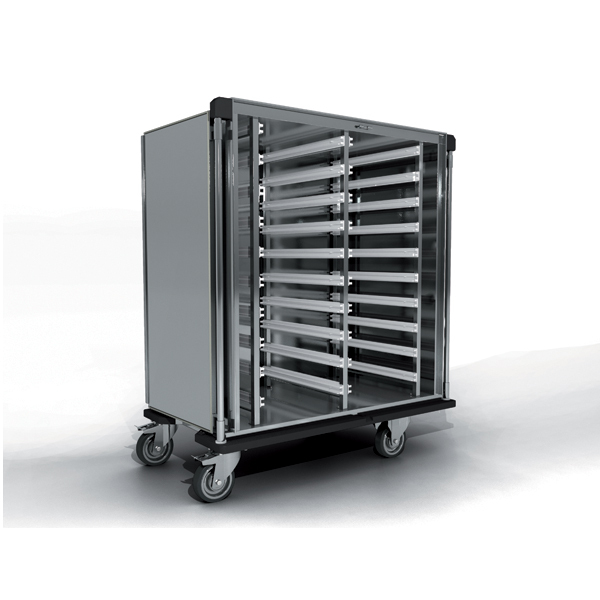 This lightweight modular cart made of anodized aluminium is designed for internal transport of modules, baskets, trays and shelves of both sterile and non-sterile goods. The cart is equipped with nylon ‘no noise click’ runners. 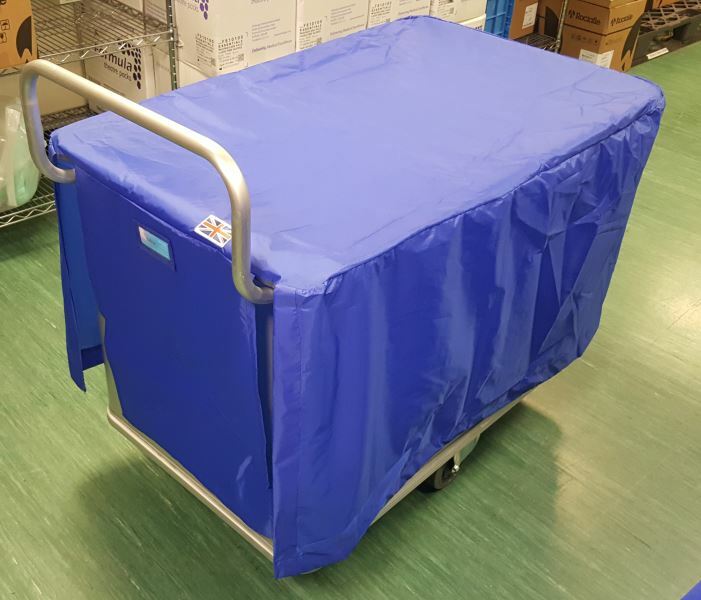 It can also be used as a closed cart in sterile environment by using a polypropylene cover which is washable up to 90 Degrees Celsius. Made in both stainless steel and aluminium. 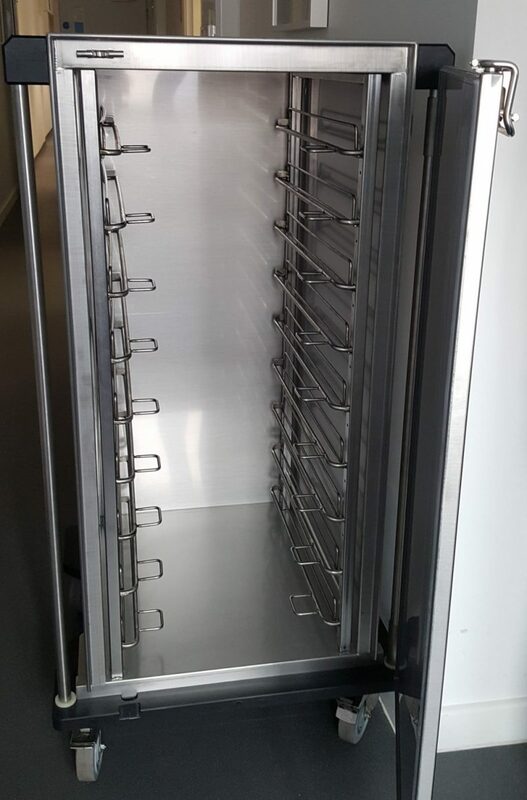 Designed for handling and transport of contaminated and/or polluted instruments to be washed and then sterilized, and delivered back to operating departments.